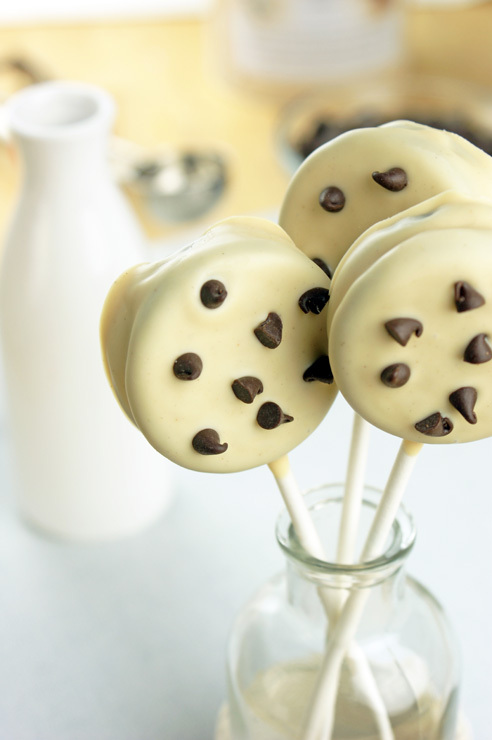 Fun cookie pops decorated to look like chocolate chip cookies! Melt Vanilla CANDIQUIK® Coating in Melt & Make™ Microwaveable Tray according to directions on package. Stir in peanut butter until well mixed. Gently pull apart each Oreo cookie; dip the top of the lollipop stick in the coating and press the lollipop stick in the center of the cookie halves. Repeat with all cookies. Pour CandiQuik coating into a deep cup (this makes it easier to dip + I use a disposable cup for ease of clean-up). Dip the cookie lollipops in melted coating; allow excess coating to drip off and place on wax paper. Immediately sprinkle with mini chocolate chips; let dry.